Sweet and Saucy Stir -Fry without the drive to pick it up. Change your every day dinner up from plain old burgers and fries to something exotic and sure to please the palete. If you love the sweet and salty, healthy yet full of flavor, you will really appreciate this dish. Chop chicken into small bite sized strips. Drain pineapple, set juice aside. In a quart freezer bag mix chicken with salt and pepper to season. In another quart freezer bag combine; pineapple, ½ cup of reserved pineapple juice, soy sauce, brown sugar, honey, garlic, ginger, and cornstarch. In a third bag placed chicken pieces-salt and pepper to season. I like to stack my bags, including a bag of microwaveable instant rice to go with it, and wrap with a large rubber band to keep it all together. Sauté chicken in a large non-stick pan with 1-2 Tbsps. Olive oil (or sesame if you have on hand, but not necessary) over medium high heat until cooked almost through. Add bag of pineapple mixture, allow to simmer for 3 -5 minutes, stirring frequently. Serve over rice or your favorite noodles. 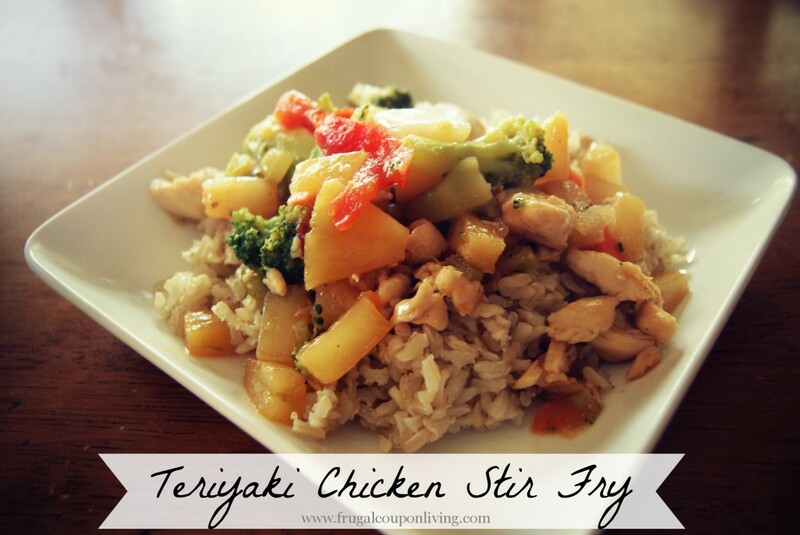 Follow all Recipes including the Teriyaki Chicken Stir-Fry Recipe on Frugal Coupon Living as well as FCLAsh on Pinterest.